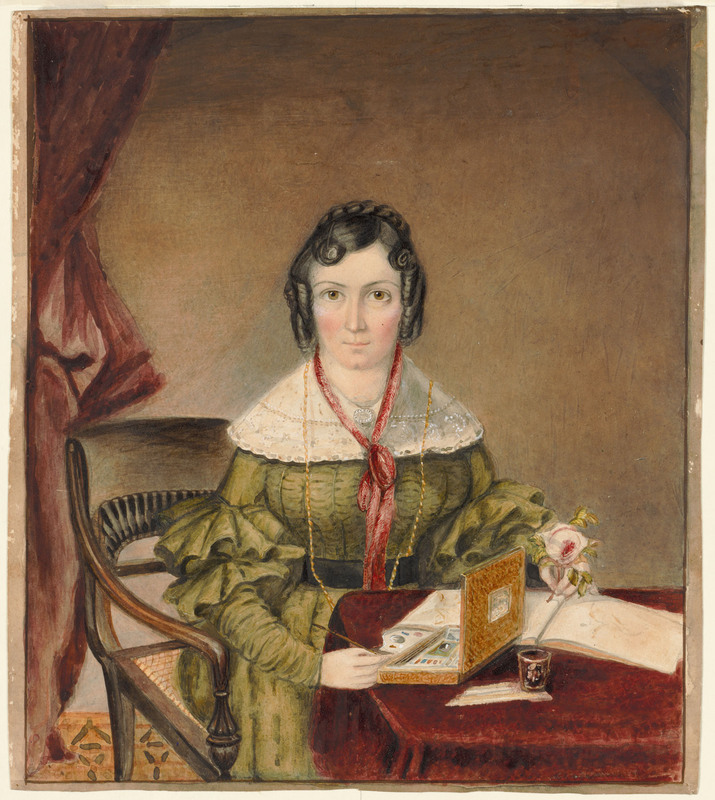 This front facing, 3/4 length seated portrait shows colonial poet, watercolourist and sketcher Mary Ellen Betts, nee Marsden (aged 31) posed within a domestic room setting in the act of painting flowers. She holds a fine watercolour brush in her right hand, and the specimen she is copying [a blooming rose] in her left. Laid out before her, on a small rectangular table covered in a red [plush] cloth, are a [timber/enamelled metal] paint box, complete with watercolours, mixing tray and white ceramic palette, a glass water jar holding down a cream fabric brush wiper, and sketch book. She seated on a carver, or elbow, chair with a caned base [possibly of local or Anglo-Indian manufacture]. The room is fitted with a geometric-patterned floorcloth, and the walls painted a reddish-brown [umber] with a [cedar] window architrave (just visible on the LHS of the image) hung with a dark red curtain drapery. Mrs Betts wears a day dress of soft [gauzy] green material which appears to have been remodelled [perhaps several times] from an earlier style. The bodice is shirred and piped in vertical channels, with a ‘broderie anglais’ (white-work) embroidered ‘pelerine’ collar, or capelet, fastened at the neck with an oval, seed pearl set brooch, and spreading out over the shoulders above the tight-fitting sleeve head which suggests a post-1836 date. Following the dramatic deflating of the ‘imbecile’ sleeve in mid-1836, the fullness of the sleeve slipped from the upper arm down to the mid-section. In this instance, it has been re-arranged into two flounced ‘bouffants’ (or puffs) anchored above and below the elbow, and loosely ruched to the wrists. The colour of the gown, and its ‘pagoda-like’ sleeve puffs, is reminiscent of the taste for Chinoiserie which enjoyed a short revival during the romantic era. The long gold, rope-like chain hanging down from her neck suspends a small watch, tucked into a small pocket on the LHS of the round waistline her gown which is set at the natural waist and marked with a black ribbon belt. Her dark hair is arranged in side ringlets and softly braided around a knot set low on the crown at the back of her head which, unusually for a married woman at the time, is uncovered. The red ribbon, looped and tied loosely in a bow at her neck, could imply that she has momentarily let her [straw] bonnet hang behind her back having just come in from the garden in her haste to record a freshly picked specimen. Mary Ellen Betts (1806-1885) was the 3rd daughter and sixth child of Rev. Samuel Marsden and Elizabeth, née Fristan, of Parramatta, NSW. She married John Betts in 1830. Betts became a pastoral pioneer, having come out to the colony as a tutor to a gentleman’s family who were settled at North Parramatta. The couple had 7 sons and 3 daughters and settled on land in the Bathurst district called Molong Station, 16,000 acres granted to his wife as a marriage gift, situated just west of Orange.